Volunteering can give your senior loved one the chance to develop new friendships, make a difference in the community, and get out of the house for a while. Even seniors receiving home care in Harrisburg can find fulfilling opportunities to meet their abilities. 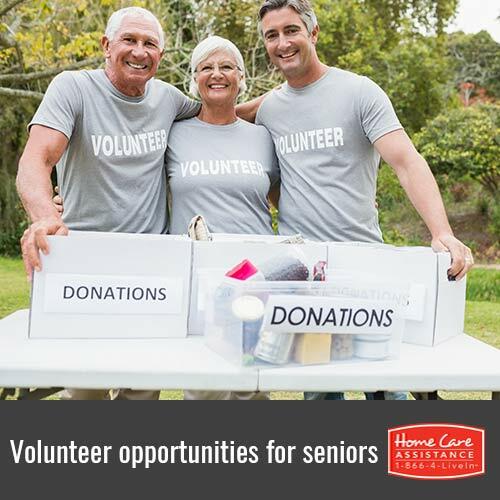 If your loved one is looking to volunteer, here are some options he or she may enjoy. Being a tour guide can offer your loved one the opportunity to turn lifelong hobbies into volunteer pursuits or learn more about specific topics that interest him or her. Many museums, universities, and botanical gardens need tour guides and often offer docent programs that train volunteers to educate visitors and lead tours. Volunteering to take care of kids is ideal for seniors whose grandchildren are living far away or for older people who don’t have any grandchildren at all. The Senior Corps Foster Grandparent program is a great place to volunteer. This program connects people aged 55 and over with kids in schools and Head Start programs. Many children’s hospitals also count on volunteers for reading stories, tutoring, and assisting families with whatever they may need while their child is in the hospital. Campaigns need people to circulate petitions, call voters, and even lead rallies for various issues.No matter where your loved one falls on the political spectrum, he or she may have invaluable knowledge and experiences that can benefit a political candidate or campaign he or she believes in. Volunteering for a campaign can also give your loved one a purpose and keep his or her mind sharp. Volunteering at an animal shelter can offer your loved one companionship and unconditional love from the animals in need. It’s also perfect for seniors who adore animals but can no longer care for one full-time. Along with caring for pets, your loved one can also help shelters with fundraisers and rescuing animals. Many nonprofits and charities need help. When your loved one donates time and efforts, it not only positively impacts those in need, but it can also be a rewarding experience. Does your loved one need assistance with mobility or transportation so he or she can participate in volunteer activities? Home Care Assistance can help. Our Harrisburg part-time caregivers can provide these services and help your loved one with a wide variety of daily tasks around the house such as cooking, cleaning, and bathing. We also offer 24-hour care, and all of our senior care services are backed with a 100% satisfaction guarantee. Call a Care Manager today to schedule a free in-home consultation.